Now that my pieces for the Muffin Tin Challenge are finished, I’m going to share the stories behind them. Many of my pieces have various inspiration or stories behind them. Some start before the piece was made, some happen as the piece is being created. This one started a while ago with the piece of Abalone I used on it. My husband and I went down to the Mission in San Juan Bautista on one of his days off during the holiday break. In the park gift store, they sell Abalone pieces that have been gathered by the local Ohlone tribe on the shores of Monterey Bay. So I grabbed a few to use in my jewelry creations. Fast forward to this month. We have had some historic rains in my part of California. I happen to love the rain. We have very hot, dry summers here, with no rain for months on end. This is my favorite time of the year aka ” The Rainy Season.” This round of storms really dumped the water on us. We had local flooding, kids were paddling their inflatable rafts in the streets, creeks that haven’t left their banks in YEARS were overflowing. I was happily creating, inspired by the storms. Wondering what was washing up on the beaches, just over the mountains from us. Wondering what was making it’s way in to our local reservoirs, being washed down in the stream beds that have been dry, some since last rainy season, some since before this drought started 5 years ago. It only seemed natural to go with water themed ingredients for this piece, but to use more rustic pieces to go with the earthy feel of the shore washed Abalone. So I focused on the pendant first. Abalone, a raw Quartz point, a polished but free-form shaped nugget of Peruvian Blue Opal, and a Cultured Pearl. Some copper wire, always at hand, to wrap, swirl, and hang everything from. 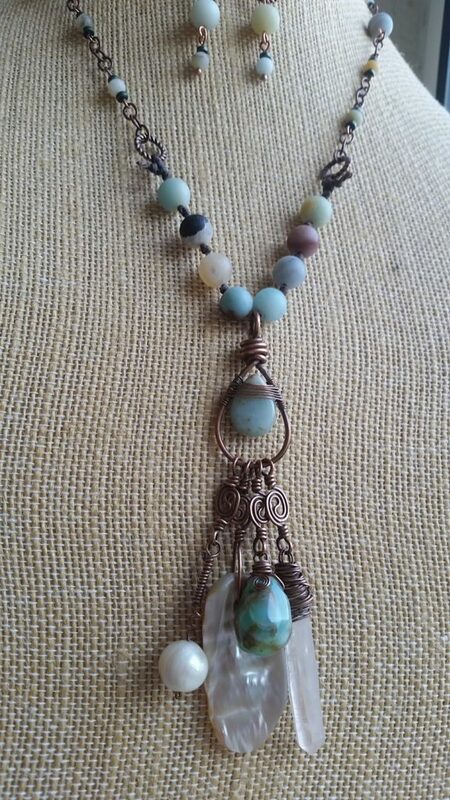 A drop shape, then a drop shaped piece of Amazonite to fill the space that seemed like it needed to be filled. Now what to hang it all from???? At a recent bead show I noticed more and more matte finished stone beads. I’ve always loved stone beads that still look like stones, unpolished, rustic, looking like they haven’t been unearthed for too long. I grabbed a strand or two of matte finished Amazonite with lots of color variations in it. Perfect for this piece, but could potentially overwhelm. 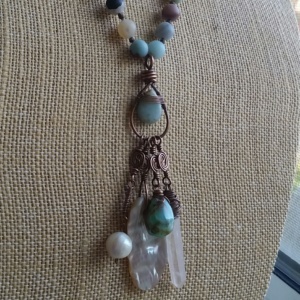 A short segment, knotted on waxed linen, connected with copper chain, accented with some more Amazonite. It all fell together. I try to make each piece of jewelry pleasantly tactile. This piece does not disappoint. The pendant also makes a soothing sound when the components clink against the shell. Almost like a natural wind chime. elements, inspiration, necklace, water. Bookmark.